While the Clearwater County Recorder provides copies of vital records and allows research at their office in the 2nd floor of the Courthouse in Bagley, MN., their website suggests visiting the Minnesota Historical Society to perform online searches of the available birth and death certificate indexes. The Society is also a good source of information on local history and genealogy resources and has a number of local branches all throughout Minnesota. 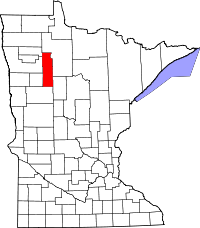 To view Clearwater County marriage records, the Recorder office links to the Minnesota Official Marriage System (MOMS), which offers marriage records available from 1903 to the present. To provide access to property records, the county uses the Landshark system, a subscription based online index with records dating back to 1912. The Clearwater County History Center, located in Shelvin, MN., also provides research assistance on genealogy, as well as help with locating additional resources.